The first round of racing toward the 2017 season kicked off today with the first day of competition at the annual WKA Daytona KartWeek event at the Daytona International Speedway. The Manufacturers Cup Series and Winter Cup are beginning the 2017 programs during the three-day event, with Thursday’s action completing the opening round for both and the nine categories and nearly 250 entries on hand. The weather was warm, not as it was last year with strong winds coming on later in the day, which could bring cold temperatures for tomorrow’s event. Overall, the action was about some solid performances and breakout victories across the board. The day belonged to TB Kart USA driver AJ Myers. 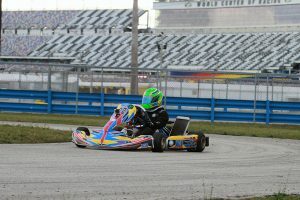 A former winner at Daytona, just in 2014 in the Stock Moto division, Myers added another victory at the World Center of Racing with a sweep in KartSport North America Pro IAME Senior. Myers set the tone with the fast lap in qualifying (40.716) to edge out 2016 champion Braden Eves (Kosmic). Myers drove away in the Prefinal to a near two-second advantage after leading all 12 laps. Eves stayed in second and lined up on the outside of row one for the main event. Myers was able to retain the lead through the start of the 22-lap feature with Eves slotting in behind him. Eventually, Austin Garrison (CompKart) worked up to third spot and placed himself on the rear bumper of Eves. While Eves and Garrison kept it close, Myers never placed his TB Kart machine wrong the entire distance to start the 2017 season with a victory. Garrison pressured Eves for the runner-up spot, posting the fast lap of the race, but was unable to work past for a position. Brandon Jarsocrak (Praga) ran third at one point, but ended up finishing fourth ahead of Jonathan Kotyk (Top Kart). Today looked to be a sweep in the FranklinKart.com Yamaha Senior class by defending champion Braden Eves (Kosmic). After earning the fast time in qualifying by over three tenths, Eves drove to a three-second advantage in the 12-lap Prefinal. It was washed away after tech when he did not pass the fuel test. This put Top Kart drivers Alexander Kardashian and Dakota Pesek at the front of the field for the main event. They broke away early in the 22-lap main event, setting up for what looked to be a great battle between the two. On lap three, Pesek engine suffered an issue, forcing him to pull off the course and end his bid at the victory. Kardashian was able to drive away, leading all 22 circuits, for the victory. Eves, starting 18th, drove his way to the second position by lap 10. The advantage by Kardashian was too great, and Eves settled for second. Completing the podium was Merlin pilot Jake Venberg, beating out a charging Chris Slinden (Top Kart) – who came up from 11th and Senior rookie Marina Walters (Top Kart). The new LO206 Senior class that will be part of the Manufacturers Cup Series and Winter Cup in 2017 opened with 32 drivers taking part. It was a solid performance by last year’s Daytona winner Corey Towles as the Florida resident defended his home turf for the opening day. The fast time in the qualifying was set by Margay driver Jordan Bernloehr. His final circuit around the course put him on the pole position for the Prefinal by just 16 thousandths of a second over Eric Fagan (Keener) with Towles off by just 27 thousandths. Towles was quick early in the Prefinal, getting into the lead by lap three and led the remaining nine laps with fast time in the race. The fight all race long was for second, with MGM pilot Zach Linsell earning the spot over Fagan with 2015 Junior winner Hunter Fox (Margay) pushing Bernloehr down to fifth. Linsell and Fagan were the top challengers to Towles. Fagan faded back, leaving Linsell to put on the fight. They each matched the others lap times – with Linsell having the best – and Linsell was never able to make an attempt for the lead. Towles took the victory by three tenths at the checkered flag. Bernloehr eventually broke away with the third, however with four laps remaining in the 20-lap main event, he lost the front tire. This promoted the fight for fourth to third, as Fox scored the spot over Jeremy Warren (Track Kart) and Fagan. Entering the weekend, there was no clear cut name that you could place a solid bet on to be the dominant driver in the Woltjer Racing Engines Pro IAME Junior class. Defending champion Pauly Massimino (Top Kart) made it clear he was going to fight for a second straight championship, posting fast time in qualifying (41.286). Placing second in the session was Tahlon Yockel, who emerged as the driver to beat in the Prefinal. The Tony Kart driver held off Junior rookies Tyler Maxson (Tony Kart) and Zane Maloney (FA Kart) as Massimino dropped to fourth. Yockel and Maloney jumped out to the front as Maxson was shuffled back along with Massimino. On lap three, Maloney worked past Yockel for the lead, and was able to pull away to a solid gap as the Prefinal winner came under pressure quickly. Dylan Tavella (Tony Kart) took over the second spot, and led a handful of drivers fighting for the position. 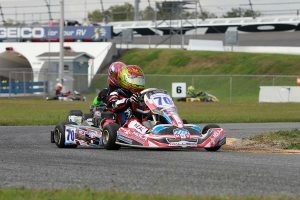 This gave Maloney a great advantage, and his consistent lap times helped establish a 3.2-second gap for the KartSport North America driver at the checkered flag to earn victory in his Junior debut. Tavella was able to fend off the challenges to earn the runner-up spot, beating Max Peichel (Tony Kart). California driver Oliver Calvo (Top Kart) drove to fourth from 11th, with Massimino ending up fifth and Yockel sixth. Colin Neal came away with a sweep in the Comet Kart Sales Yamaha Junior division, challenged in the main event. Neal (Tony Kart) scored the fast time in qualifying and drove away to a 2.6-second advantage in the Prefinal. Elliott Budzinski (Tony Kart) got the jump on Neal to lead the first six laps of the main event until Tyler Ferris (Top Kart) took over the position. It appeared to he had the lead in hand, until Neal put on a late race charge. By lap 17, Neal took the lead for the first time and was able to hold on to the checkered flag for his first victory. Ferris settled for second with Emory Lyda (Merlin) moving onto the podium in third after working past Budzinski while Arie Venberg (Merlin) placed fifth. The OTK USA Rok Shifter made its Daytona KartWeek debut, set to be part of the 2017 Winter Cup. 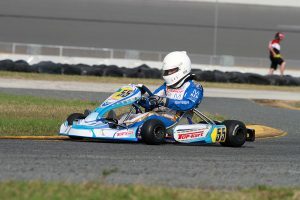 Vincenzo Sarracino (Tony Kart) became the first ever fast qualifier, breaking the 40-second mark with a 39.949-lap. An issue in the opening corner put Sarracino on the sideline, opening the door for Rory Van der Steur (FA Kart) to drive to the race win, until he was removed in tech, giving Jonathan Kotyk (Top Kart) the win. Sarracino worked his way from P6 on the grid to second by the halfway point, and put the pressure on Kotyk. The Florida driver led wire-to-wire, holding off Vincenzo for the victory. Rory was able to work to third to complete the podium with John Perry Hilton V (Tony Kart) and Andres Ceballos (Kosmic) rounding out the top-five. Second year IAME USA East Pro Swift Sportsman driver Ashton Chilton (Tony Kart) swept the day for his first ever victory in the category. Chilton posted the fast time in qualifying, edging out Lucas Rodriguez (Benik) by 18 thousandths of a second. Chilton was able to drive away to a 2.1-second advantage in the Prefinal, as the fight for second went to Brent Crews (Nitro Kart). Contact in the opening lap shuffled up the field early with Chilton getting away and Santiago Trisini (Benik) trailing. They ran 1-2 the entire distance of the 20-lap feature. Aiden Baker Crouse (FA Kart) drove from 12th to finish on the podium in third, with Rodriguez following him from 14th on the grid to fourth while Nicholas Terlecki (Merlin) finished fifth. Qualifying was the only session William Robusto did not lead the Allison Racing Engines Yamaha Sportsman class on the day. Robusto missed out on the fast time in qualifying by 14 thousandths with Nick Snell (Benik) posting a 45.657-lap. Robusto got the jump at the green flag for the Prefinal, leading all 12 laps. The Final was the same thing, except this time the CompKart driver pulled out to a near seven-second advantage over 20 laps. Mateo Rubio-Luengo (Kosmic) won the fight for second over Anderson Leonard, giving Nitro Kart its first WKA podium finish. Garrett Adams (FA Kart) advanced up to fourth with Brent Crews making it two Nitro Kart drivers inside the top-five. It was a dramatic day in the CRPRacing.com Mini Swift class. 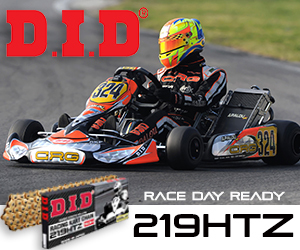 Mateo Rubio-Luengo (Kosmic) set fast time in qualifying, and was challenged in the Prefinal by Caleb Gafrarar (Parolin). Gafrarar worked past for the lead in the Prefinal by lap seven, and Mateo spun a lap later, relinquishing the second spot. Gafrarar drove to the win with Frankie Iadevaia (Nitro Kart) placing second. Gafrarar jumped out to the lead in the Final, establishing a good lead over the fight for second. With 34 karts in the field and incidents early on, lap traffic came early. This allowed Iadevaia to close up and put the pressure on Gafrarar. The two continued making their way around lap traffic with Iadevaia getting closer until lap 19 when Frankie made contact with a lap kart. He fell down to seventh in the order, while Gafrarar cruised to the race win, his first at Daytona. Rubio-Luengo ended up second with Calem Maloney (Formula K) completing the podium. Alex Powell (Tony Kart) placed fourth with Christian Miles (OK1) in fifth. Friday is Day 2 of racing, counting as Round Two for both the Manufacturers Cup Series and Winter Cup programs. 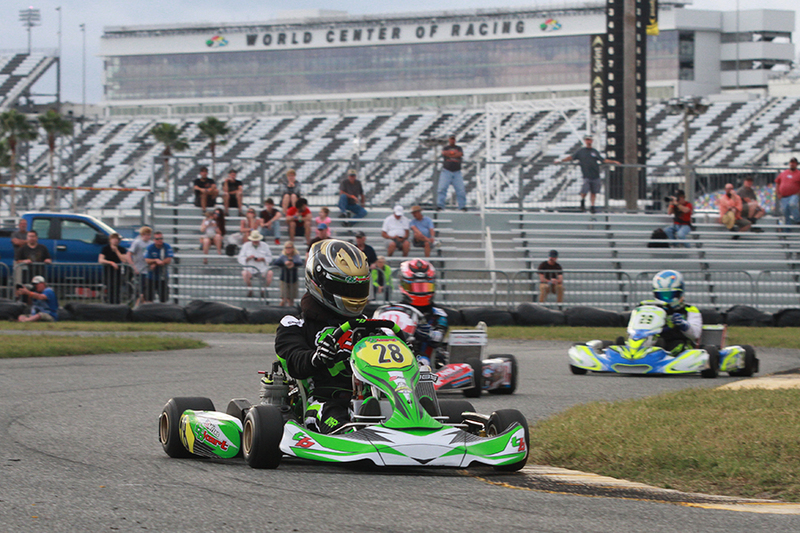 Listen live all day at ekartingnews.com/live for audio coverage with Xander Clements on the microphone for Qualifying, Prefinal and Final sessions to close out the WKA Daytona KartWeek event.